Relationship problems? Go to Paris. Need to bring back the romance in your relationship? Go to Paris. Looking for love? Go to Paris. I am convinced that the city of love could make a gay fall in love with a straight and the other way around. It’s that romantic, yes. Everywhere you turn people are kissing…parks, bridges, the metro, sidewalks, cafes, bathroom lines…everywhere. The city oozes romance, you feel it the minute you step out of your airport cab and you can not escape being swept up in the midst of it all. It’s the most romantic place…ever. Being in Paris with the person you love is, in the simplest form, a treat. I do understand that a trip to Paris is not realistic for all people (It’s not for me!) but I promise, with all of my hopeless romantic heart, that it will be worth all the energy and effort put into saving enough money to make this dream become reality. Listed below are my suggestions of what to do while in the city of love. 1. Montmartre-Love. Love. Love. Take the steep steps up to this magical little section of the city. The streets are filled with artists, vendors, and people, both tourists and locals, many of who are standing outside of quaint bars having a mid day drink. While you are up there, walk around Sacre Coeur…there is a small park with a beautiful view of the city on the backside. 2. Cafe Lunch– Enjoy an extra long lunch (complete with wine) on the patio of any one of the city’s cafes. 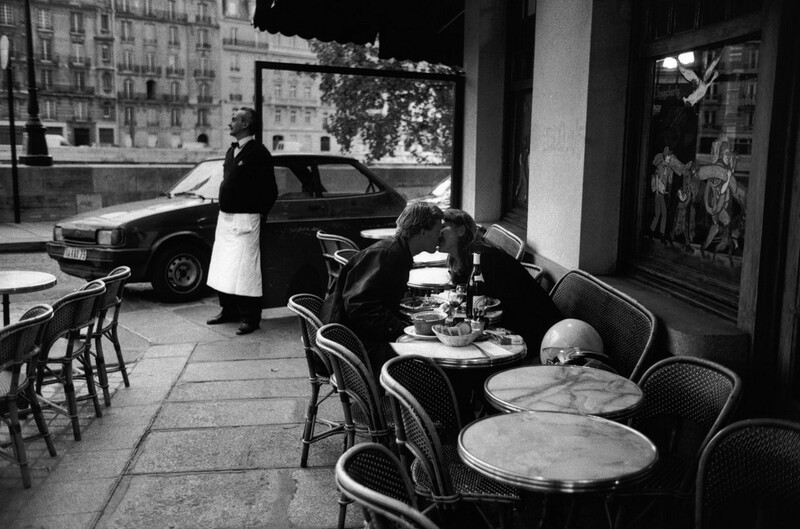 Don’t forget to wrap up lunch with a cigarette (why not, it’s Paris!) and an espresso. 3. Luxembourg Park-Busy and beautiful, take a stroll through this park that is filled with people reading, writing, and relaxing. Children line up to purchase ice cream from vendors, teenagers play frisbee and soak up the sun with friends, and lovers lay in the grass. Partake in the action or observe while passing through…either way, it’s a must. 4. The Latin Quarter-Quintessential Paris with it’s quaint streets lined with boutiques, cafes, and shops. This charming part of the city is one of my favorites and has a constant buzz at all hours of the day. Once my boyfriend left town I changed hotels and stayed here for a week. I roamed the streets night and day, falling in love with the city each and every time. 5. Pere -Lachaise Cemetery-I came here once I was by myself in Paris. If you find old cemeteries to be enchanting and beautiful, this is the perfect place to wonder alone. It’s almost entirely shaded by large trees and the grave stones date back hundreds of years. Turn on your music and get lost in your thoughts and in the maze of dated beauty. 6. Eiffel Tower– My boyfriend informed me that were were not going to the Eiffel Tower because it was “SO touristy”. I found this to be absolutely hilarious. I quickly brought him back to reality and made him realize that he was not quite the local he thought he was after spending a whopping 10 days there. I did not care to take the time (since we only had a couple of days) to go up in the tower, but wanted to get there to do a quick couple of pictures that would go on my bookshelf. Paris pictures are forever and a picture or thirty three with the ET in the background is without question, a must. 7. Ile de la Cite– The birth place of the city, this small island is situated in the middle of Paris and is home to Notre-Dame Cathedral. The most memorable part of the trip was sitting on the bank of the Seine with my boyfriend, sharing a bottle of wine and a cheese sandwich, while watching the river boat cruises pass by slowly. It was a perfect hour and a half that we sat there and talked about how amazing it was that we were there sharing that moment together. A true “thank you God” moment. Head to the tip of the island and you will find a small shop that sells bottles of wine (twist off and they supply the cups) and snacks **Suggestion-If you are with your lover, bring a metal lock. At the top of the stairs there is a bridge where people write or etch their names and the date on a lock, secure it to the bridge, and throw the key in the river (ugh, isn’t that SO romantic?!). 8. Hemingway Bar, Ritz Carlton– Paris is all about indulgence and extravagance. One of the big indulgences during our time in the city was heading to the Ritz after a romantic dinner and having drinks at the Hemingway Bar, where Hemingway spent a great deal of his time while in Paris. We sat in the cozy, intimate bar and talked about our trip while sipping $45 dirty martinis. Ridiculous? Yes. Worth it? Absolutely. The Ritz Carlton Paris is one of the most famous hotels in the world and to have the opportunity to be there and spend time in the most famous bar in Paris is a definite must…especially if you, like dream world Brittany, enjoy putting on a dress and heels and pretending for a couple of hours that you can afford a standard guest room that costs around $1000 a night. Oui, Oui! Paris is love and love is Paris, so go. Follow my list of suggestions and there is no doubt that you will leave in a cloud of love. What happens after Paris? There are no guarantees, but the romance is worth the risk so soak it up and have a little too much champagne along the way! *Suggestion-Always be sure to get a couple solo shots with the Eiffel Tower. Remember, you are on an absolute love high in Paris and when you get home reality does settle in and things may not work out. You will always want a Paris picture for your bookshelf, so out of respect for your future spouse, get some sans the lover.